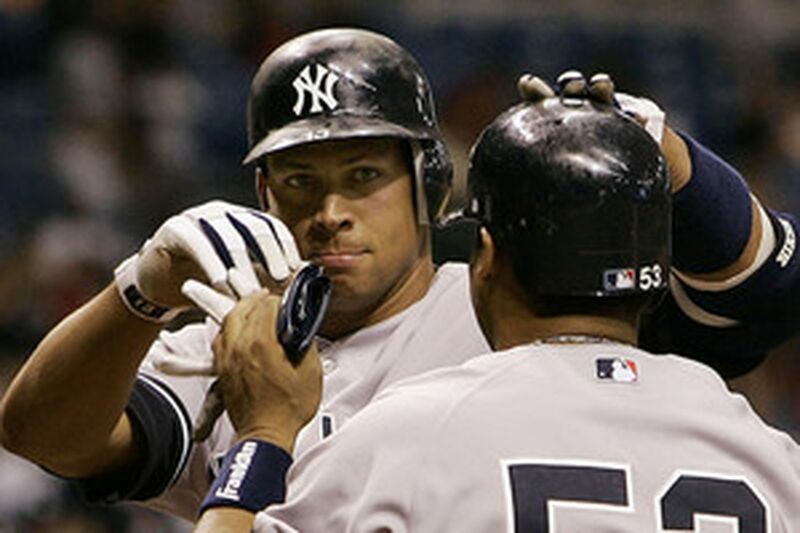 Alex Rodriguez (left) is congratulated by Bobby Abreu after ninth-inning homer vs. Tampa Bay. NEW YORK - The teacher eyed the pupil with that familiar bemused face. Looking past a trio of reporters who had waited out a slew of evasive maneuvers for 3 hours, Alex Rodriguez stopped in midanswer and asked Larry Bowa, "You want to stand in for this?" "No," said Bowa. "I'll read it tomorrow." "Can you put into words the way you feel . . . "
" . . . at the plate?" continued the reporter. Four more minutes of this was hardly worth the wait, but that is precisely the point. Urged by Bowa in the spring to stay vanilla this season, Rodriguez has matched his hot start with a rather cool, even icy veneer. No expansive answers about his feelings. No smiles and soul bearing as in years past, the kind of stuff that would make him a great male guest on "The View." And a headline-making machine in the most headline insatiable city in the world. "I just try to keep things really simple man," he said. "Just try to play. That's it." Chalk one up for Bowa. Because, so far, it's worked. Rodriguez reached 14 home runs faster than any player in major league history. He has 34 runs batted in already. On a team fighting through injuries to its starting pitchers and sabotaged by its bullpen - sound familiar Philly? - Rodriguez' two walkoff home runs have been like cold Perrier in Death Valley. At this pace, he would hit 119 home runs and drive in 290 runs. If A-Rod is ever to take over New York, now would be the time. And yet, the big tabloid picture the day after his 23-game hitting streak ended in Tampa was of Derek Jeter grimacing on the ground after being hit by a pitch. The captain is on his own quiet little 14-game hitting streak, and the captain, Rodriguez has learned painfully, is always the story in New York. And that brings us to the conversation that will follow Rodriguez through his fourth season in pinstripes. Will he exercise an opt-out clause and become a free agent at the end of the season? Will the Yankees want him after this season? "Abilitywise, we certainly want him here," Yankees manager Joe Torre said before Tuesday's 6-4 loss in Tampa. "Sitting in the middle of our lineup and making the statement he is right now, we certainly don't want him to go anywhere . . . I have no idea, but I'd like to believe he's going to be here." Throughout the late fall and winter, Rodriguez insisted he would not ask to be traded and had no interest leaving in New York. Of course, what got him in trouble this spring, what brought the teacher to the pupil, was when he speculated on a radio show that this might be the season fans run him out of town if he didn't do well. Now? He nimbly avoids any proclamation. Unless "I love New York" is such a thing. "I've always thought that, even when I was really bad last year," he insisted to reporters Tuesday night. "I still thought it was the best place for me. I've never been a guy that just runs away from my bad play; that's the way I am. Things haven't changed. "It's the greatest place for me to play." His sincerity is easily measured in dollars. New York's $189 million payroll dwarfs all but a handful of teams in the league. And should Rodriguez opt out of his final three seasons, he will have to make up the $81 million due through a new deal with another club. Perhaps that's why he insists, "I want to stay in New York. No matter what." And perhaps why he's trying to, in his recurring words, "Keep it simple." As he said Tuesday: "If you had asked me this when I was in Seattle my last year, I would have given you a three-paragraph answer. Now I'm just loving playing the game." What no one knows, of course, not even Rodriguez, is whether this new approach will redefine him in New York come October, if there even is an October. It's sacrilegious in these parts to say, but the best thing to happen for him might be the current odd juxtaposition of Alex very, very good, Yankees very, very bad. Then his season would count for what it is, and there is no stamp of authentication - or lack of one - via his postseason performance. The old Alex Rodriguez, before Bowa got to him, might have even expanded on that theme for you, might have mulled it and hung it on his uniform with all the other Post-its he has seemed to play with in his three preceding seasons as a Yankee. "No need to speculate," he said. "Just take it 1 day at a time." All vanilla. All the time.